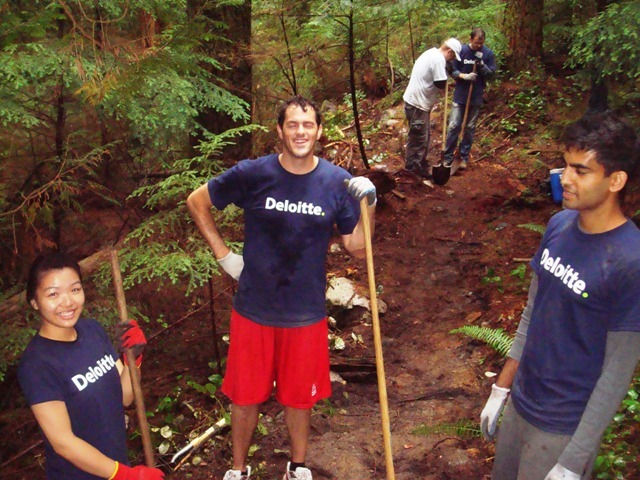 On Friday, September 23rd, NSMBA President and Acting Trail Director Mathew Bond (that's me) led a crew of 20 volunteers from Deloitte up to Dreamweaver. 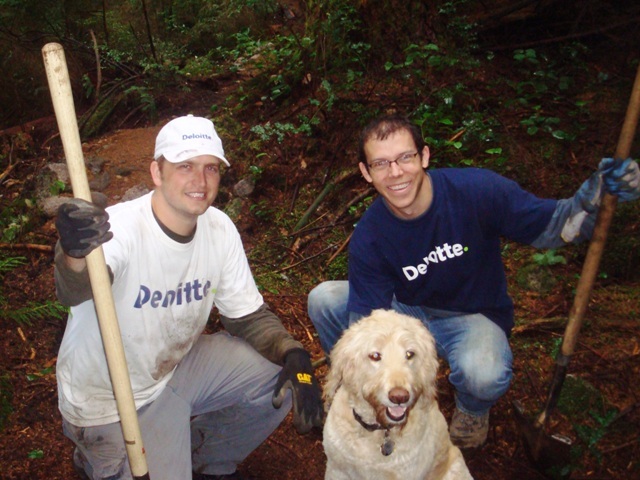 This is the fourth year in a row that Deloitte has supported the NSMBA's trail maintenance efforts with their Impact Day program. 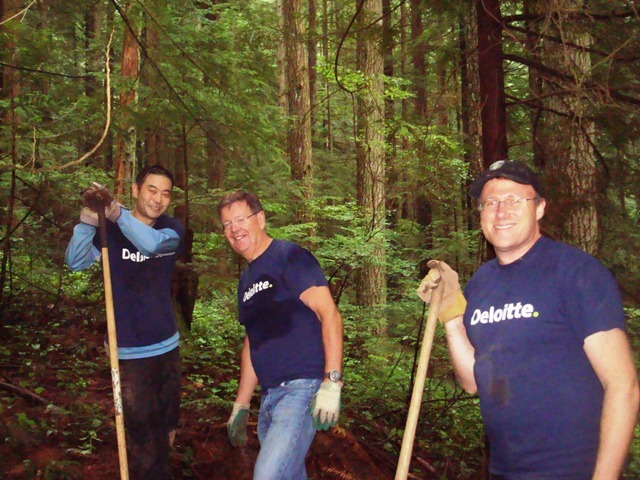 Every September, employees from Deloitte spend a day volunteering their time in the community, and what better way to spend the day than trail building! 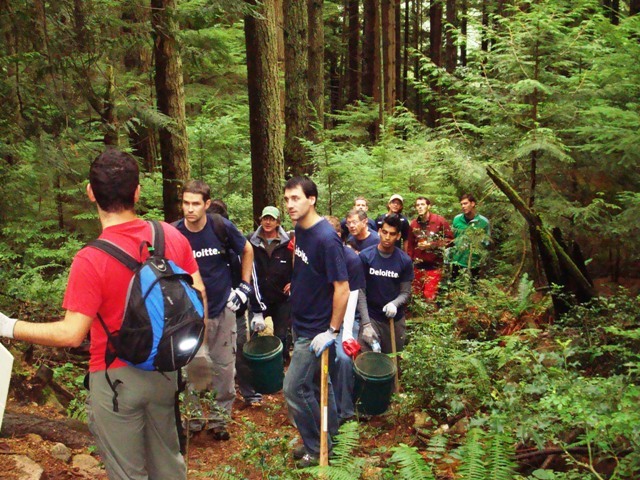 While some of this years crew were trail day veterens, most were eager new recruits. My short briefing included an explaination to the accountants of how to hold a shovel, and to stay away from the "business end" of the tools while others were working with them. After a much needed coffee break, and some statistical analysis (based on historical data and predictive algorithms) showing that our efforts were 95.4% likely to be successful, I led the troops into the forest to start our work. While the section of Dreamweaver above Baden Powell follows quite a sustainable alignment, between Baden Powell and St. Marys there are many fall line sections that have suffered serious erosion. These sections no longer suit the intermediate character of the trail, and the DNV Trail Crew started rerouting the trail at the end of the summer. 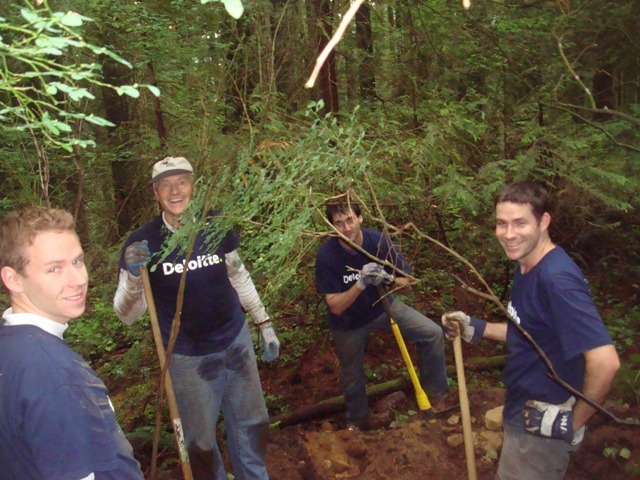 With a rough re-route already completed by the DNV, our team put on the final touches by completing the grading of the trail, finishing off the trail surface with gold dirt where needed, and removing any excess construction debris from the adjacent forest floor. Some volunteers worked so hard they were fast asleep, but still standing and smiling! 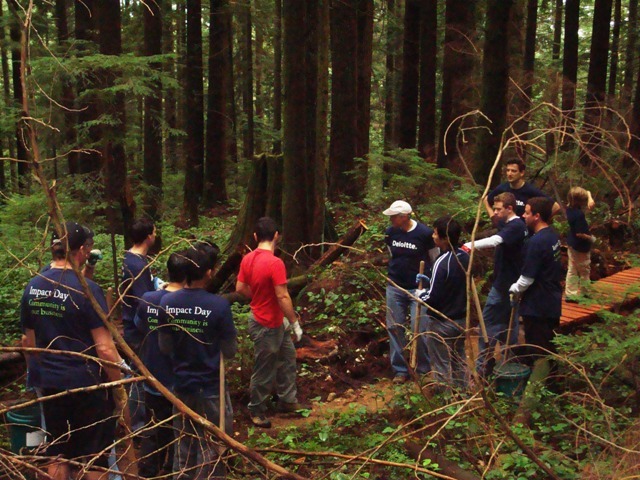 The crew of volunteers was enthusiatic, hard-working and eager to learn. It was a rewarding experience for all and I look forward to having them back again next year.